EcoColors p-phenylenediamine free nontoxic hair colors deliver professional results, with its gentle and nourishing emollient soy base. EcoColors will restore your hair to a tone that is natural looking, shiny and visibly healthier while naturally blending the gray away! Woudn't you rather use a more gentle and safer hair color? Our hair care line of products contains the highest quality natural and organic ingredients and are in compliance with the European Commission strict ingredients regulations and have been evaluated for safety and quality. EcoColors' hair color base is enriched with flax, castor and jojoba oils and the addition of natural antioxidants such as vitamin E and C, nettles, rosemary, organic flower essences and grapefruit seed extract to just name a few. It's also totally gluten free, ppd free and contains no propylene glycol, sulfites, heavy metals or mineral oils. 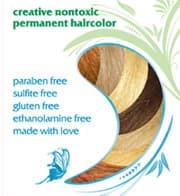 EcoColors Nontoxic Permanent Hair Colors are formulated for professional salon use. 24 nourishing natural color shades that can be combinedand spark your hair color ideas and start new trends! Create stunning blonde hair colors, reds, rich chocolate dark browns and black. All this without a whole bunch of harmful chemicals. EcoColors non toxic permanent hair color system has been created by a Master Hair Stylist/Colorist with more than twenty five years experience in the salon industry. After experiencing strange rashes, headaches and asthma due to the exposure to toxins in hair colorants, Lisa developed the best nontoxic professional hair color line with natural hair colors that covers gray permanently. Read her story here. Since 1998 EcoColors permanent hair dyes have been consistently the best in terms of performance and quality in regards to gray coverage and condition of the hair after hair coloring. It should be noted that many people who were allergic or suffered from sensitive scalp while using other hair color brands do not have any allergic reaction to EcoColors hair color; of course, we strongly recommend if you have a history of allergies to follow the allergy patch test instructions we provide. Allergies surface over time with repeated exposure. It is unclear what triggers allergic reactions. The EcoColors Professional permanent hair color system is based on the standard level and tone system and is available in 24 inter-mixable natural hair color shades. The color line is complimented by a range of 5, 10, 20, 30 and 40 volume Gel Activator Developers. Our non toxic hair colors are not for semi-permanent or temporary hair coloring, but are formulated for permanent gray coverage. They can also achieve up to 4 levels of lightening. A DIY "home hair color kit" is also available in 15 natural hair color shades. We also offer Eco Education classes for hair stylists and colorists to familiarize you and teach you the best way to work with EcoColors hair color products. With silk, to strengthen the integrity of the hair and prevent breakage and loss of hair. Most people who are allergic to other hair color brands do not react to EcoColors Hair Color and is usually suitable for people who suffer from allergies or sensitive scalp. Please follow the recommended allergy patch test according to the instructions because EcoColors Hair color is not a "cure all" for all allergies even though it is a ppd free hair dye and does not contain many hair color ingredients that could trigger sensitivities. At any time you may become allergic to any substance (or already be sensitized without knowing it). Why allergies come and go is not well understood at this time. EcoColors is the only permanent hair dyes of it's kind in the world and has constantly been fine tuned since 1998. EcoColors Professional hair color line remains the clear alternative for hair stylists who want to go green in their hair salons and reduce their daily exposure to toxic chemicals. So, don't wait to develop allergies or sensitivities to switch to a better hair color line, order EcoColors today! Register and activate your professional account today!.